Alonzo Adams is a living testament that you can maximize opportunities if you free yourself from limited beliefs. 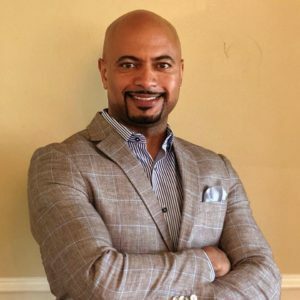 He turned a small cleaning company that he started out of his one-bedroom apartment into one of the most successful independent residential cleaning companies in the world. His company, Busy Bee, was awarded the Best House Cleaning Company in Philadelphia by Philadelphia Magazine. They are the first and only cleaning company to receive this honor multiple times. In 2010, he was elected President of the Association of Residential Cleaning Services International. Alonzo’s keynote speeches have inspired organizations, business leaders, and associations throughout the country to think big, be courageous, and take chances. Alonzo has three children: a son, a daughter, and a step-son. His biggest love is God. God has helped him to be first and is always his number one guide. Alonzo got started as an entrepreneur when he was a kid. Many people sold snacks and drinks to people, but he took it further and sold goodies around the neighborhood from his red wagon. Alonzo’s business has been around for twenty-six years while he himself has been in the business for thirty-five years. Thinking big and scaling his business to match demand have really helped him be successful. You want to be working on your business. You don’t want to be working in your business. Having a system that can be replicated, has really helped Alonzo. Document your processes. If you have a system that other people can easily pick-up and replicate, it’ll increase productivity. A business needs a proper foundation for sustainable growth. Entrepreneurs are finders who hire minders which help grow and put together the company’s vision. There are also grinders who are the workers. You need people who believe in what your company stands for and who are willing to enforce it. How can you develop personally and help others at your business develop on a personal level? Business leaders should want to help their employees grow so when they move on they can show growth and reflect on their experiences from their time with them. How can people connect themselves to the company’s goal? They have to see what’s in it for them and what the endgame is. This builds the company’s culture by letting people see the goals and the bigger picture. Show them where you’re going. Alonzo relates a story about one of his best managers that has been working for him for about twenty years now. Originally he wasn’t going to hire her when she applied. She was young and he thought he would just be raising another kid. His son had met her out front before the interview and asked his dad if he was going to hire her. He said she was really nice and that she really wanted the job. Alonzo hired her, and the first year or so was really challenging. She was in a rough spot, but he asked her what she saw in her future. Step by step they made changes to help her get to a better spot. She dealt with her addictions. Then she found an apartment. Later, she got her drivers license. Eventually she had made enough progress to buy her own house. Don’t just dream big. Thinking big is a skill, but you have to have the initiative to jump on that thinking and make it a reality. It’s about the execution and the drive. Always give your all, and don’t let set backs overshadow your goals. We’re good when things are good, but once things get tough we have to figure out how to push ourselves to do what we need to do. Share with us how you believe your mindset affects your life? You have to have the right mindset because the conditions won’t always be right, and you’ll just have to act. Mike Tyson said, “Everybody has a plan until they get punched in the mouth.” You have to figure out what your plan will be when you’re punched in the mouth. Don’t fear nothing. Be fearless. What do you do daily to bring Energy into your life? You have to recharge and be able to clear your head. I have a morning routine of meditating and getting away time to clear my head and mind. Share the number one connection that has made the biggest impact on your life? My mom. She set a solid foundation and believed in me. She taught me that you have to create a plan to accomplish what you want, and then if you put i the work you will accomplish what you want. Define in one sentence or less, what legacy you want to leave on the world? I want to leave the world better than when I entered. I’m here to help others grow by giving my time. It is important that I help my children to grow up to be selfless and giving.